Black women have always struggled with their hair and we the black community are the only ones who can relate to the hair struggle. Many wish they could get their hair wet without worrying how it will look after drying and we also have to sleep with fabric clothing on our heads so as not to mess our hair. We worry so much about our hair but what we forget is that we can also grow that healthy black hair if we dedicate our time and resources to it. Black hair is always growing but the women will always complain how their hair is stagnant and not growing longer and is weak despite the effort they put to take care of it. But what they do not know is that the hair will not grow if it is damaged and breaking. I will therefore give you tips on how to grow healthy black hair. a. Keep the hair moisturized- black hair is curly and that is why oil from our roots takes longer to reach the ends of one’s hair. That is why the ends are the most damaged parts of the hair thus use conditioner while washing and leave it for around 15 minutes before rinsing it out. b. Use oil in your hair- infuse your hair with oils like olive oil, castor oil and coconut oil as these natural oils help with the growth of hair. c. Trim the split ends- the damaged hair will always slow growth of your hair so once in a while trim the dry ends. d. Protect the ends of your hair- since the tips of one’s hair receive the least amount of oil they are brittle so sometimes put your hair up in a bun using bobby pins or braid your hair so as to avoid damage. e. Eat healthy foods- you are what you eat and some foods have proven to increase hair growth and makes it healthy and reduce the breakage. Those foods are salmon, avocados, spinach and eggs. a. Avoid using heat- high temperatures make the hair dry so one is advised to try air drying their hair. b. If you relax your hair try and wait as long as you can between sessions before relaxing again. c. Be gentle to your hair by combing it slowly as it reduces the amount of breakage. Styling your hair is one tip on how to grow healthy black hair as it doesn’t require one to keep redoing their hair. Some of those styles are braiding and twisting which protect the hair. We can all grow healthy black hair whether we go natural or chose to relax it. 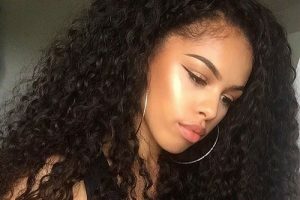 Those are the few tips that tell you how to grow healthy black hair and if you apply them in 2 to 4 years you are guaranteed healthy, long and beautiful hair. Healthy black hair looks beautiful, I take care of it carefully, always use the right, high quality products which deeply nourish and moisturize my hair from roots to ends.